The Attendance Awareness Month convening partners are calling on Superintendents across the country to raise your voices and lead the effort to improve attendance starting in the early grades in your community. While schools alone can’t do all it takes to improve student attendance, every successful initiative ultimately relies on educators deciding to make the reduction of chronic absence a priority. Prioritize Attendance: Make clear that improved student attendance is one of your top priorities. Ask your teachers and school leaders to make it one of theirs as well. Designate a senior member of your staff to oversee implementation. Mobilize the Community: Reach out to make improved student attendance a broadly owned and widely shared civic priority. Engage parents, civic and elected leaders, local businesses, clergy members and the libraries, museums and service providers. Drive with Data: Use data to raise public awareness, establish targets and goals, track progress and assure accountability. Please join us! Take your first step by accepting this challenge. Read our letter to superintendents across the country. See the list of who else has signed the Call to Action in 2018. 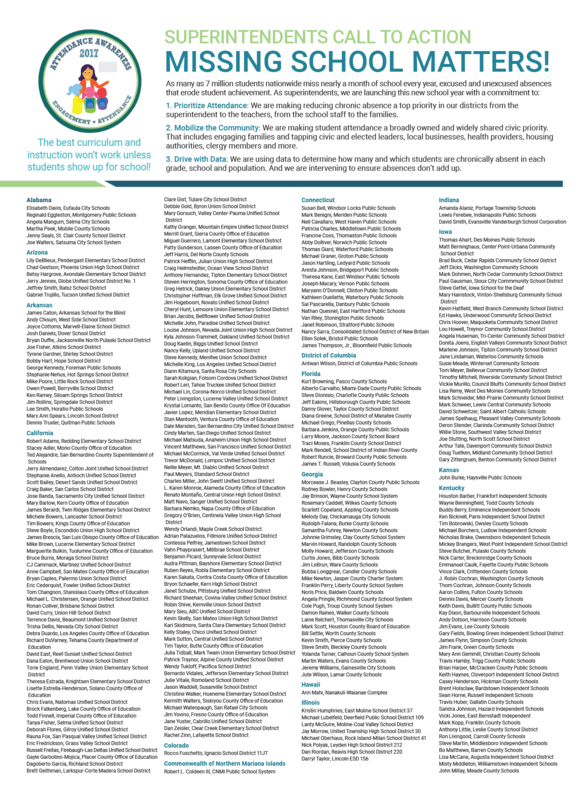 To demonstrate the widespread support for the Call to Action, we placed an ad in the Sept. 19 edition of Education Week listing all the superintendents who have signed on and provided us with an estimate of their district's chronic absence data. Click here to view the 2018 ad. View Bringing Attendance Home video. Join us for Attendance Awareness Month in September! Download the “Count Us In!” toolkit for tips on how to launch Attendance Awareness Month in your community. The toolkit offers a variety of options for promoting good attendance. Choose which options work best for you and tailor the strategies to reflect the strengths and assets of your community. If you’ve signed the Call to Action, consider using or adapting these media tools to help spread the word about your district’s involvement. Use this as an opportunity to build awareness about reducing chronic absence and invite key stakeholders to join local efforts to improve school attendance, starting in the early grades. Consider sending an op-ed to your local media. Download a template commentary piece. Demonstrate the commitment of community partners to make attendance a priority with a joint op-ed. Download a template joint commentary.